In the World of Bugs series, author Brandee Mae has transformed the concept of a children’s book into a work of art showcasing the world of bugs up close with stunning vivid images of common insects. 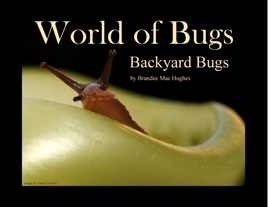 Backyard Bugs is filled with pages of vibrant close ups of everyday insects in their natural environment. Children will learn facts about 8 different types of bugs through vivid detailed photographs of many common insects such as butterflies, ladybugs, spiders and more. This book is great! It has beautiful pictures and really teaches some cool facts about bugs. This book contains many high quality photographs of insects in their natural environment. The photographs are beautiful and really show that bugs are something to be revered, not feared. 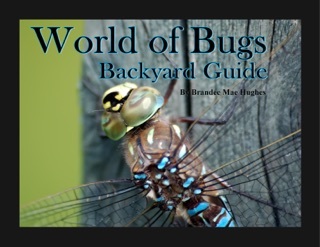 The book contains educational content to teach children about different types of insect. The hi-res photos make it suitable for anyone with an interest entymology of all ages, but the book is geared towards children age 2 and up. I highly recommend this book to parents who want to teach their kids about Nature and the beauty of all the creatures on the Earth.